The most well known version of Italian polenta, in my experience, is the soft and creamy porridge style – what we call grits in the United States. Savory and hearty for breakfast or as a dish served similar to risotto – topped with braised mushrooms, grilled shrimp, or simply with cheese. If you want a grits recipe, check out grits with eggs and red sauce. But there’s another way to prepare and serve polenta, which I’m calling “the other polenta.” It also deserves a little attention and respect. This kind of polenta is more like a soft yet dense cornbread. As with American cornbread, this bread-like polenta is wonderful served with stews, pasta, soups, or even salads. It also makes a fabulous appetizer, topped with cheese and served with white wine. Lorenza de-Medici refers to this polenta appetizer as crostini di polenta. In her cookbook The Villa Table, she states, “I always make more polenta than a recipe requires in order to have some for making crostini for the next day!” It’s a great idea! I’ve seen polenta used in so many ways in Italian cookbooks, like molded into a timbale served with a meaty ragu, or as dumplings, or layered into a casserole or pie. But however polenta is used, it comes down to preparing the softer creamy version, or the drier, sliceable variety that I’m making today. 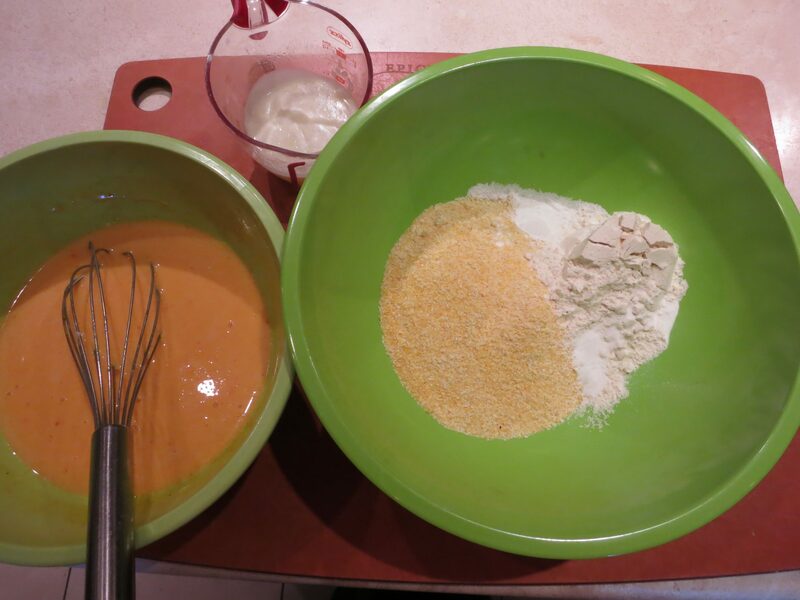 Have 2 cups of cornmeal on hand in a bowl. Heat 6 cups of slightly salted water in a heavy pot on the stove over high heat. When it comes to a boil, slowly pour in the cornmeal. Whisk well, then turn the heat down to the lowest position, cover the pot and let the polenta cook for 30 minutes. Remove the lid and give the polenta a stir. Depending on the grind of the cornmeal, it might be cooked already. Give it a taste and test if it’s gritty, which would indicate more cooking time required. My polenta looks a bit grainy because it’s a coarser grind, but it’s fully cooked. Add a little more water if you feel it could stick to the pot, but keep the additional water to a minimum. Then cover and cook for 10-15 minutes more, still over the lowest possible heat. Butter a 9″ x 13″ cake pan. You can also use a cookie sheet or jelly roll pan. Let the polenta cool completely, even overnight, covered tightly with foil. When you are ready to finish the polenta, preheat your oven to 350 degrees. Sprinkle the cooled polenta with grated cheese; I used Gruyère. Then bake the polenta until the cheese barely browns a bit, about 30 minutes. The baking of the polenta dries it out, or solidifies it more, if you will, plus it melts the cheese. This step could probably be done under the broiler if you feel your polenta is stiff enough to already slice. Remove the pan from the oven and set aside to cool slightly. To slice, flip the pan of polenta over onto a large platter, then flip it onto a cutting board, cheesy side up. Alternatively, slice inside your pan if it’s not non-stick like mine. Cut squares or strips of polenta and serve warm. With wine, of course. Today I served the baked polenta with a fresh asparagus soup! Alternatively, you can cut squares or shapes of the polenta, place them on an oiled baking sheet and then bake them. I’ve seen so many different variations that I don’t think it matters as long as you eventually get to the lovely cheesy polenta. In fact, I’ve seen polenta squares fried on both sides before serving, and also grilled. But I like the easier way of keeping everything in the cake pan, then slicing. If you love polenta or grits, you will surely loved baked polenta! note: You can use chicken broth in this recipe if you feel the polenta might be too bland for your taste. I’m not a huge cornbread lover. For one thing, when I first tried it after I moved to Texas a million years ago, it was way too sweet. And unnecessarily sweet. So I stayed away from it for years. But then I started making it from scratch, and ignoring the sugar. I like it much better sugar-free – besides, corn is already sweet! But, the great thing I’ve learned about making cornbread is that you can do so many different things to it to make it your own, and really compliment whatever entrée you’re serving with it. Cornbread can be Southwestern with the addition of chile peppers, or it can be Mediterranean with the addition of olives. You can herb it up in the summer, or add any kind of flavor during the winter months like sun-dried tomato pesto. And, of course, you can always add cheese!!! Today I wanted my cornbread fairly plain, but I wanted a little flavor enhancement and beautiful color from achiote oil. 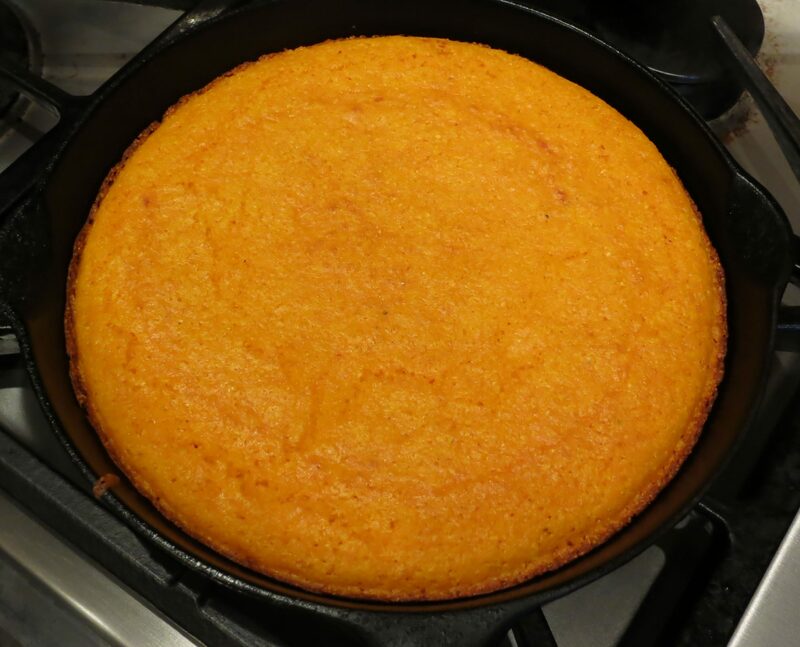 So here’s my recipe for Skillet Cornbread with Achiote Oil. Preheat your oven to 425 degrees. Have a 10 – 12″ iron skillet on your stove. Get your dry ingredients together in a large bowl. Then place the buttermilk, eggs, and achiote oil in a medium bowl. Whisk until smooth. Have your melted butter handy. When your oven has preheated, turn on the heat under your skillet and let it pre-heat. 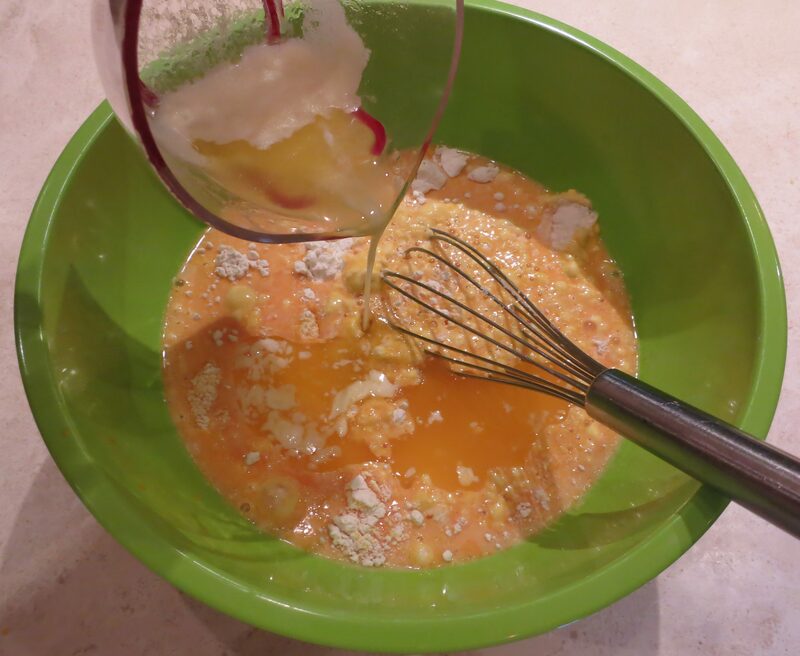 Combine the wet ingredients with the dry ingredients, whisking just until smooth. Using a little extra achiote oil, grease the skillet. Then pour the batter into the hot skillet, an immediately place it in the oven. Bake for 18 minutes. It should be nice and golden and the middle should be somewhat firm to the touch. Remove the skillet from the oven and let the cornbread cool a little for about ten minutes. Loosen the sides, then remove the cornbread onto a cutting board. Slice into wedges and serve warm!